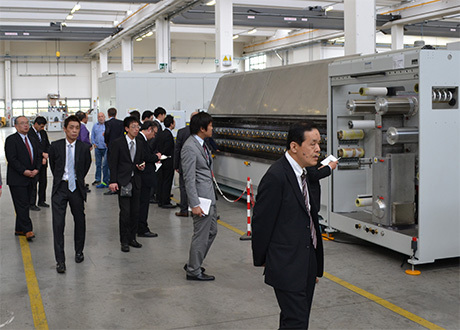 On March 31, 2016, an important delegation from Japan visited our plant in Bentivoglio (BO), Italy. The group was composed of experts working for some of the most important cable manufacturing companies in a number of different sectors, ranging from automotive to aerospace, through building and control cables. Organized by “Densen Shimbun”, a famous Japanese newspaper specialized in wires and cables, the tour takes place every two years with the aim of visiting the major European suppliers of wire and cable manufacturing technology, before concluding their tour at the international Wire Show in Düsseldorf. At Sampsistemi, the Japanese delegation had the opportunity to listen to an informative welcome speech by our CEO, Lapo Vivarelli Colonna, as well as to several technical presentations about our latest innovations by our Product Managers, Enrico Conte and Giorgio Puggioli. Subsequently, the delegation was taken on a guided plant tour, where they could see many of our machines and lines on show and running. The tour was rounded out by the presence of some of our most notable technology partners, including CJ-TEK, Fainplast, Guidetti, Esteves, Bechem, La Farga Group and Travar Tec. As the perfect conclusion to an interesting and exciting day, our guests ended their visit with a traditional Italian dinner held in a wonderful 16th-century villa not far from our plant. We would like to take this opportunity to thank the entire Japanese delegation, their organizers and partners who visited our headquarters in Bentivoglio and look forward to welcoming them again in 2018!